Among other things, Steven Spielberg is known for transporting audiences into brave new worlds, and in “Ready Player One,” based on the novel by Ernest Cline, that world is the massive virtual simulation of the OASIS, where humans in a broken world plug in and become anything they want to be. A master at stoking the imagination, Spielberg manages to lay a framework for this endlessly expansive and chaotic movie universe, coaxing some magical moments of entertainment from a mile-a-minute script. 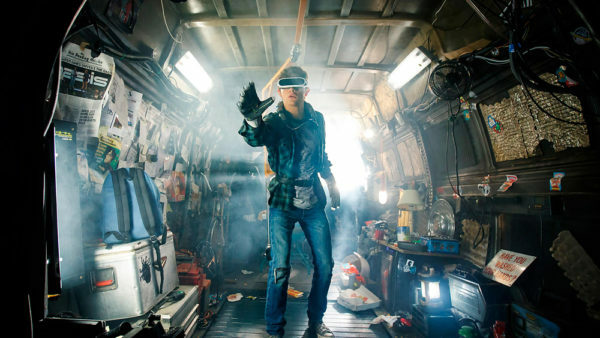 Cline and superhero movie scribe Zak Penn find interesting ways to tweak the book’s many non-visual story elements and allow for some excitement to unfold on screen, but “Ready Player One” in many ways amounts to a large, hyperactive child rampaging through a virtual toy store and play-fighting with toys from the ‘80s, ‘90s and 2000s. The film hardly sits still, communicating tons of information at lightning-fast speed and barreling from scene to scene. Rarely are there moments to breathe and connect with the characters and savor their interactions or emotions. To be fair, Cline’s novel creates a complex, jargon-filled universe in which he has the luxury to devote chapters to backstory and context, which the film can ill afford. Wade Watts (Tye Sheridan) lives in a trailer park “stack” in Columbus, Ohio with his aunt and her deadbeat boyfriend, escaping on the regular to the OASIS where he becomes his avatar Parzival. Along with many others “gunters,” he spends all his time in search of a series of keys that will lead to the simulation’s ultimate easter egg, hidden by OASIS creator James Halliday (Mark Rylance) before his death. A la Willy Wonka, Halliday offers the egg’s finder control of the OASIS, which is not only tempting to the common user, but also IOI, a major company led by Nolan Sorrento (Ben Mendelsohn), that has monetized OASIS access and poured all its resources into finding the egg. From there it’s a race to find the keys in every sense of the word, turning the film into a geek-culture reference-filled joyride that fittingly offers little more than escapist thrills. In some ways, that the film can move this fast and make sense at all is impressive, especially coming from a director who has been making big-budget movies at slower speeds for five decades. Yet Spielberg’s experience also comes with knowing how to visually communicate information with efficiency. Most audiences should be able to follow the film — processing it is another matter. Spielberg made his career on making big stories feel small and personal. You can identify moments “Ready Player One” tries to do that, but the script doesn’t lay enough of a foundation for him to succeed on the whole. The scope of the story widens quickly and rarely shrinks back down. Wade/Parzival almost instantly makes the transition from nobody to big hero, specifically he’s never fully established as a nobody. He and friends Aech (Lena Waithe), Art3mis (Olivia Cooke) Sho (Philip Zhao) and Daito (Win Morisaki) are easy to root for, but there’s little sense of history or chemistry. At one point, a character breaks away from an intimate moment with another character to announce a plot revelation. The movie also spoils its chance to show their journeys, to tell a story of people with low self-esteem in the real world finding it in each other. Maybe it tells that story to an extent, but with almost no resistance and certainly no time to soak it in. Most of what’s included in the film serves story and plot purposes, and that allows “Ready Player One” to be an engaging adventure, but the human stuff — the stuff we watch classic Spielberg adventure movies for — gets tacked on only when it aids the forward motion of the story. If “Ready Player One” was meant to echo a video game experience and the constant digital bombardments we subject ourselves to on a regular basis, then goal achieved. It’s wild, inventive and visceral, a virtual thrill ride to be sure that makes enough sense to keep us in the illusion start to finish. But the experience is almost exclusively sensory and physical, not emotional. It’s a little too easy to walk away from these characters and the OASIS in the end.